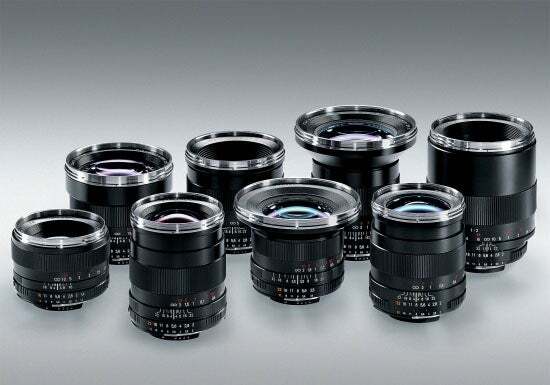 Carl Zeiss has announced a forthcoming range of lenses compatible with the Nikon F bayonet mount. The lenses feature a built-in CPU, enabling the transmittal of EXIF data, and arrive under the ‘ZF.2′ moniker. Seven focal lengths are available in the new range – 3,5/18, 2,8/21, 2/35, 1,4/50, 2/50 1,4/85, 2/28 and 2/100 – with the first number referring to the maximum aperture. The lenses are available at the end of November, with the 2/28 and 2/100 to follow early next year, and for further information either visit Zeiss online or see below for full press release. Optics specialist Carl Zeiss today announced its introduction of a new series of lenses for the semi-professional market: the ZF.2 with F bayonet for digital SLRs. Thanks to its electronic interface (CPU), these new ZEISS lenses support all- important operations such as the automatic mechanisms for time, aperture setting and program. The CPU also supports manual exposure settings, including those for camera casings that are not AI-compatible. Since the lens now transmits the EXIF data such as manufacturer, date, metering system and exposure to the camera, photographers no longer need to set the parameters manually. These quicker and faster handling capabilities of the ZF.2 lenses are especially useful under hectic shooting conditions. ZEISS lenses truly come into their own in situations that demand extreme photographic creativity and maximum image quality. Carl Zeiss’ established fixed focal length lenses are known for their high light sensitivity and precise manual handling, leaving the photographer in full control. The new ZF.2 series will be especially interesting for photo enthusiasts who value creative, high-quality images combined with the comfort of automatic settings. The ZF.2 lenses are available in eight focal lengths, six of which will be available from the end of November: 3,5/18, 2,8/21, 2/35, 1,4/50, 2/50 and 1,4/85. The Distagon T* 2/28 ZF.2 and macro Planar T* 2/100 ZF.2 will be introduced in Spring 2010. ìWe are currently completely reworking and optimizing the Distagon T* 2.8/25 ZF. As a result, it will be available for other mounts somewhat later,ì says Klottig. The prices for these new lenses will lie between EUR 545 and EUR 1.386 (excluding VAT). With the new ZF.2 series, Carl Zeiss extends its acclaimed ZF family of lenses, for which there is still high demand and possibly long waiting times. ìWe will offer the ZF series as long as the demand lasts,î stresses Klottig.